About the artwork: My work focuses on creating a feeling of tranquility, stillness, and contemplation. These are paintings inspired by harmonious settings, reflecting a sense of renewal and beauty. I am moved by the power of simplicity; when I paint I’m seeking to distill a landscape down to its most essential forms, eliminating unnecessary details. As I begin a painting, the focal point is often the sky, and the rest of the scene takes its cue from that mood and movement, evolving to find its own voice. Patterns of light and shadow first emerge on the canvas as chords of color, then as the work progresses, objects take shape as land masses, ribbons of water, tree lines and clouds. The serene landscapes of my childhood, neatly patterned fields rolling to meet the first hill of the Appalachians, remain a powerful visual memory. A sense of wonder and gratitude when observing the ephemeral beauty of the natural world informs my work. With my paintings, I hope to convey both the peacefulness and the spiritual presence so tangible in quiet vistas. About the artist: Ann was raised in eastern Pennsylvania and in New York City. She was deeply influenced by both the rural vistas of her childhood, and Manhattan’s vibrant art museums. 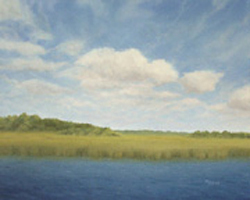 The Southeastern U.S. has been her home for more than twenty five years, and she often paints the local hills, fields and coastlines of the Carolinas. 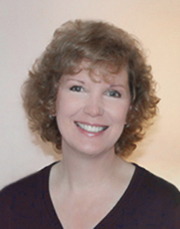 Ann began painting and drawing as a young child, and exhibited her artwork during high school in the National Scholastic Arts program, yet initially thought of fine art as a much-loved hobby, focusing on a corporate career instead. She earned bachelors and masters degrees with honors at Western Michigan University, and she continued her studies while her work included publishing, public relations, teaching, and media projects with both government and corporate clients. She also has years of experience in the commercial arts field, with graphic design work. As a volunteer for historic preservation and land conservation efforts, the beauty and significance of those places profoundly influences her art. Ann studied painting for a number of years with talented professional artists, both through individual instruction and in workshops. Her art training also includes studio classwork at Moravian College in Pennsylvania, and at Western Michigan University. Among her artistic influences are Andrew Wyeth, Wolf Kahn and Edward Hopper. In addition to painting, Ann also teaches art, and works on projects such as green housing and air quality initiatives.